All of the 380 spacious and functional rooms at the Menara Peninsula Hotel Jakarta offer an ideal ambience for rest and relaxation. Our newly renovated Club Rooms and Suites are elegantly and stylishly decorated for the most well travelled business travelers and comes with services and amenities of a modern 4-star hotel in the Jakarta business district. Book your hotel room in Jakarta now on the official website of the Menara Peninsula Hotel Jakarta to lock in a fantastic deal at the best rate available online. Measuring 28 square meters, the Superior Rooms at the Menara Peninsula Hotel Jakarta are ideal for individual business travelers and couples and are a perfect base for any visit to Jakarta. Comfortable rooms with a full range of services and amenities including flat-screen TV with satellite channels, minibar, air-conditioning, safe, free Wi-Fi, coffee and tea-making facilities, and a bathroom with full amenities. The Deluxe Rooms at the Menara Peninsula Hotel Jakarta measure 28 square meters and provide sleek and elegant furnishing accompanied by all of the services and facilities expected of a 4-star hotel in the Jakarta business district including a flat-screen satellite TV, minibar, air-conditioning, safe, free Wi-Fi, coffee and tea-maker, and a bathroom with full amenities. The 44 square meter Superior Suites at the Menara Peninsula Hotel Jakarta are all well-appointed and tastefully furnished to maximize comfort and relaxation. A separate lounge area provides a large desk with free high-speed internet Wi-Fi, in addition to a flat-screen satellite TV, individual air-conditioning, minibar, laptop safe, coffee and tea-making facilities, and a bathroom with full amenities. 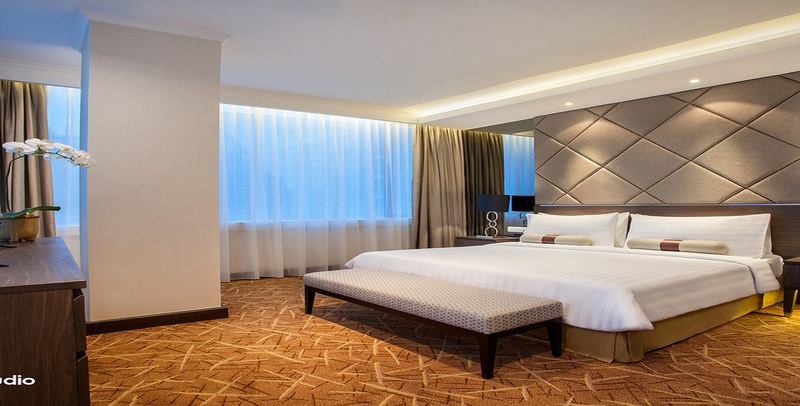 The newly-renovated Club King Rooms at the Menara Peninsula Hotel Jakarta measure 32 square meters and provide access to the extensive and exclusive Club Floor services and facilities. Elegant, stylish and totally comfortable, they provide a king-size bed, free high-speed Wi-Fi, a flat-screen satellite TV, individual air-conditioning, minibar, safe with space for a laptop, coffee and tea-making facilities, and a bathroom with full amenities. The newly-renovated Club Studios at the Menara Peninsula Hotel Jakarta provide stunning views of the Jakarta skyline and surroundings and measure a generous 44 square meters. Designed to provide a separate lounge area and bedroom for added privacy, they are equipped with free high-speed Wi-Fi, a flat-screen satellite TV, air-conditioning, minibar, laptop safe, coffee and tea-making facilities, and a bathroom with full amenities. The newly-renovated Club Junior Suites at the Menara Peninsula Hotel Jakarta are furnished in luxurious style and measure 45 square meters. Providing a lounge area separate from the bedroom to allow greater privacy, they are equipped with free high-speed Wi-Fi, a flat-screen satellite TV, air-conditioning, minibar, large safe, coffee and tea-making facilities, and a bathroom with full amenities.